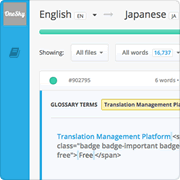 OneSky cares about the productivity and happiness of our translators. We launched a brand new translation tool with a bunch of improvements according from the feedbacks from the translators. The new tool helps the translators to do their jobs in a much easier way providing better quality too.